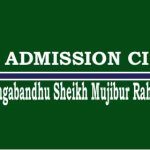 Bangabandhu Sheikh Mujibur Rahman Science & Technology BSMRSTU publishes BSMRSTU Admission Circular 2019-20 on their official website bsmrstu.edu.bd. Interested candidates can apply for the BSMRSTU through their official website. Read the full Article and Check the Full Admission Circular below. The Admission Test Circular Already Published. According to the Circular From September 16 2019, the online application process will start. Bangabandhu Sheikh Mujibur Rahman Science & Technology is also known as Gopalganj University for its location. If you are looking for Gopalganj University admission Circular then be sure that here it is. According to the notice board of Bangabandhu Sheikh Mujibur Rahman Science & Technology University, BSMRSTU Admission process will start on September 16, 2019, and the last date of online application is 22nd October 2019. After the end of the Application, students have to collect admit card from their official website bsmrstu.edu.bd. Online Application Closes on October 22, 2019. Rest of the unit, Science students must have 6.50. Students from other groups(Business Studies and Humanities) have to obtain 6.00 out of. Students of O level and A level has to obtain B Grade in 3 (three) and 2(two) Subject respectively. There are 7 Faculties & 1 Institute in Bangabandhu Sheikh Mujibur Rahman Science & Technology University. Each of the Faculty known as Unit. Candidates have to pay 800/= BDT (Eight Hundred Taka) For Each Unit. They can pay through SureCash mobile Banking or Agent Point. Transaction ID must be saved for downloading the Admit Card. Do you have any Queries about BSMRSTU Admission Circular 2018 Feel Free to ask as through Comment Section. সার্কুলার কবে দিবে জানেন ? bsmrstu te ssc & hsc er GPA te koto mark. koto die gun kora hoi? please help.